Yet another adaptation of a WWI poem by the Italian poet Giuseppe Ungaretti, sensitively translated by Marco Sonzogni and Ross Woods. The comic is the product of an ongoing collaboration with Sonzogni and Woods, and with the New Zealand Centre for Literary Translation at Victoria University in Wellington. 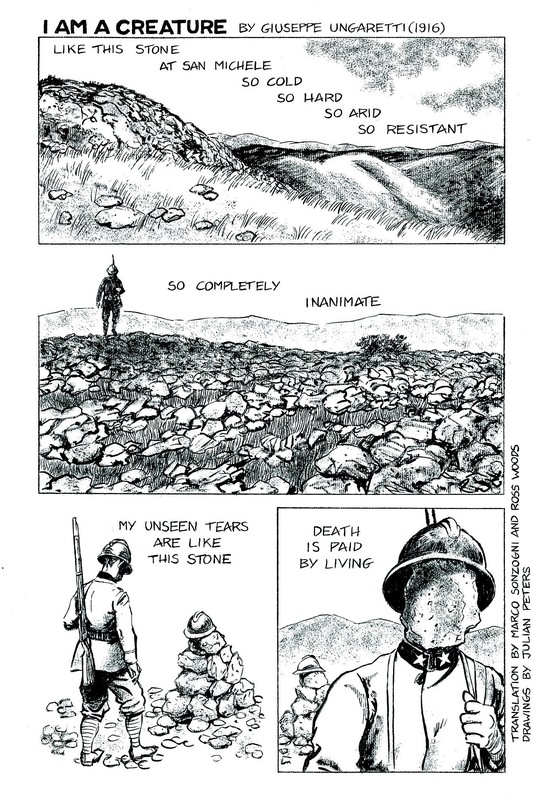 This entry was posted in comic book poetry, Giuseppe Ungaretti, new zealand centre for literary translation, Poetry Comics, Poetry translation, victoria university wellington, World War One and tagged carso, fumetti, i am a creature, Italian poetry, italy, marco sonzogni, monte san michele, ross woods, sono una creatura, world war one poetry. Bookmark the permalink. An arresting and even chilling adaptation, Jools! I like to think Ungaretti would approve and be proud of such a tribute! Grazie Marco! I was completely flummoxed as to how to illustrate this one until I saw some images of the military cemetery at Colle Sant’Elia, in which helmets and weapons sit atop various commemorative cairns. Reblogged this on A Thousand Words of Deep.